After discovering he has superpowers, an ABC teen in South Pasadena considers life as a superhero. He briefly thinks about the practicalities and impracticalities of it. In considering what sort of image he wants to give himself, he thinks about the images of the many Asian American superheroes that already exist in his universe. Most of them are superheroes in ethnic enclaves and they reflect that as well. Being an ABC in a predominately white area, he struggles with how he wants to present as himself, more Chinese or American, modern or traditional, public or private. In the end, he likes both sensibilities but decides he wants to go more modern and will make sure people know that he’s Chinese American. 2: Super powers? Do I really want to become a superhero? 3: I’m just a teen! I’ve got enough worries. 4: Up ‘til now all I ever thought of was the American dream. 5: Oh, what am I thinking? I couldn’t live with being a super sell-out. 6: Honor, ethics, integrity, all that stuff needs to be on my face. 7: Even with a disguise, I’m still under judgment! 2: They usually kick it in their own neighborhood. 3: Most superheroes stay loyal to their ethnic enclaves. 4: Do I really represent “South Pass”? Not enough Asians around here. 5: I know I’m an ABC, but I’m not empty on being Chinese. 6: What kind of image should I make myself? 7: How do other Asian American Superheroes handle themselves? 1: Red Face. Or “Hung Min” in Cantonese. Hometown: LA Chinatown. This guy’s a legend, been around since the railroad workers. He’s so traditional; got that Peking Opera looks. Some say he’s General Kwan incarnate. 2: Ultimate G. Hometown: Little Tokyo, CA. The golden age old schooler. He’s had that classic American superhero style for a long time. UG’s rockabilly haircut is so cool. 3: The Goddess of Guns. Hometown: Monterey Park, CA. Modern and mythical combined. She’s got skills. I heard she can even slow down time. 4: Immortal Shaolin. Hometown: NY Chinatown. Shaolin guys are always so old school. Least he had enough sense to get some decent high tops. 5: Golden Mask. Hometown: San Francisco Chinatown. That Golden Mask sort of has a retro look to him. I don’t want a mask. I’m tired of wearing something on my face. 6: Tako-Man. Hometown: San Francisco Japantown. Ha ha, Tako-Man! It takes guts to go out like that. People say he used to be a wrestler who had a nervous break-down. But he’s pretty good at fighting crime. 1: Action Sentai Squad. Hometown: Honolulu, Hawaii. Man! I wish I was in Hawaii! So much Japanese and Islander influence. It’d be nice to be on a team with their own giant robot. 2: Gameleon Rider. Hometown: Hilo, Hawaii. Half man, half Chameleon; Japanese Ridin’ stylin’! My motorcycle isn’t even half as badass as his. 3: Invincible Cop. Hometown: San Gabriel, CA. This guy’s on city payroll, but he’s completely worth it. Bet he gets lots of red tape but least he can live like an ordinary person this way. 4: Super Pinoy. Hometown: Mira Mesa, CA. Super Pinoy has so much Pinoy pride. He always seems so lax and loves being a superhero. I wish I could have his attitude. 5: K-Girl. Hometown: LA Koreatown, CA. Hey, I’d like to know her a little better! Her identity’s no secret but I’ll bet that has its downsides. Her outfit’s kind of classic contemporary. 6: Colossor. Hometown: Torrance, CA. 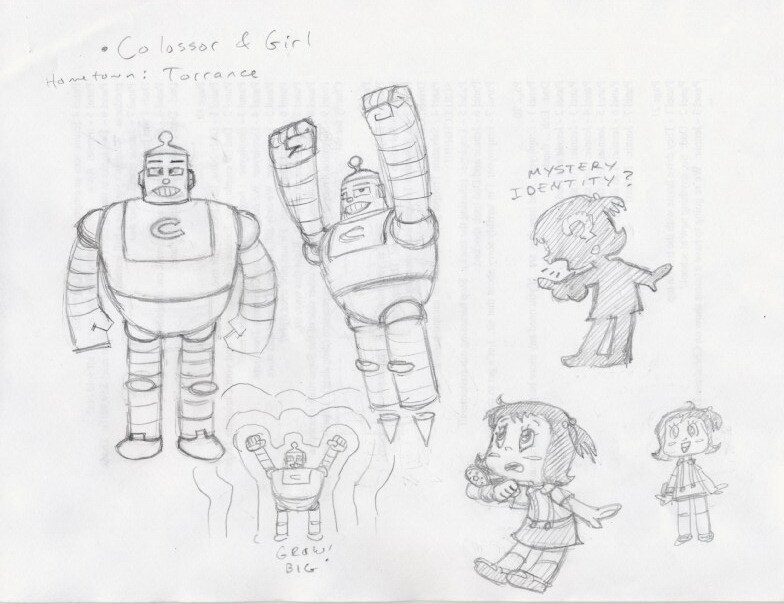 Rumor has it Colossor’s remotely controlled by a little Japanese girl. She doesn’t even need to worry about changing into a costume. 1: Everyone’s so different… I should just go my own way. 2: This isn’t the smartest thing to do, but something tells me it’s the right thing.